She also shared some cryptic illustrations of fake money with me and asked me to share my thoughts on the symbolism behind all of this because she was afraid. I AM NOT a fan of fear mongering so I checked it out. And although I’m curious if it is indicative of some sort of crisis that will happen today at 4:00 PM, when the counter on the website ends, I’m also fascinated by the viral marketing techniques this person or group of people has used to get the word out about their anti-government message. First, the dream that promoted my follower to reach out to me. I posted this on Facebook yesterday. “Last night I dreamed that there was this serialized book that was being released chapter at a time online. It was about demons and everyone was totally addicted to it, including me. There were videos embedded in the text of action scenes from the book. The video I was watching got really weird. It was like a swirling red vortex and this ugly demon with a dripping face was talking like a slowed down record playing backwards in a language I couldn’t understand. Then a weird, crazy script started scrolling across the screen and it became pixilated. I wanted to turn the computer off but I was sucked into the video and couldn’t move. I thought, ‘I have to reach Adam.’ Then I flung my arm out and apparently, I hit Adam in the throat. He woke up cursing and asking me why I hit him. I apologized and said I was having a nightmare. So when my friend directed me to http://www.badselfeater.com because she said that what’s going on online sounded like my dream, it perked my curiosity and I had to check it out. I googled the image she told me to check out and I came up with this. The Where There is No Night series I’m working (in the query trenches with the first book) involves a lot of occult symbolism and references to Revelations in a modern context so right away I started breaking the symbolism. First of all, it’s interesting because Revelations is widely thought to be about Emperor Nero. If I had to guess, this person has taken a note from St. John and applied Revelations to politicians of our time. It’s pretty common for writers and artists and holy rollers to do that; Revelations is ripe with symbolism. 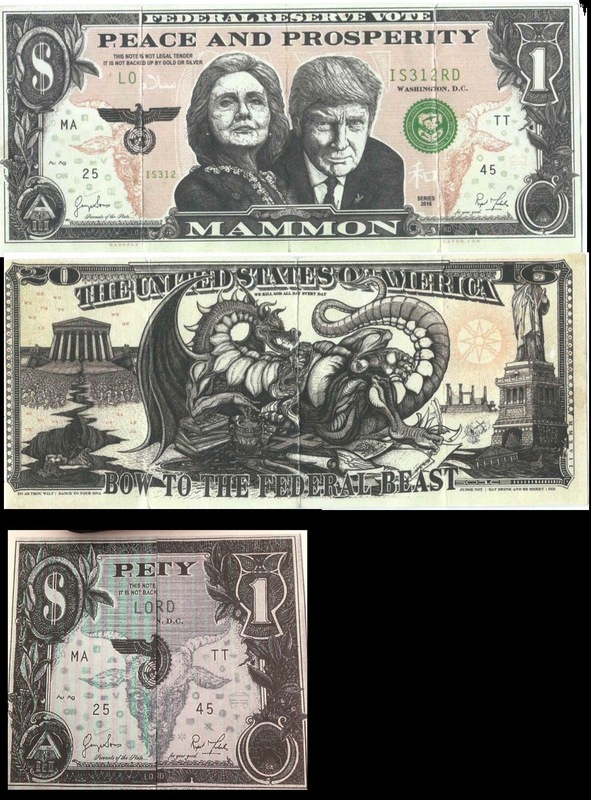 Mammon is a name of “the Devil”, probably one of the many ancient gods that became demonized when the church was trying to stamp out paganism. Funny because this bill “demonizes” politicians. I believe the “A” to stand for either Armageddon on Anarchy or Adonai. I’m going with Anarchy though because this person seems like he or she definitely wants to see a violent revolution. There’s an orobous, the sign of the recycling of universal energy. This most likely related to this political cycle and federal banks that need to “forcefully” be destroyed before “we’re destroyed”. There’s a compass which I think is a reference to the Angels of the four directions who will be main players in the Apocalypse (Raphael: east, Michael: South, Gabriel: West, Uriel: North). It could also mean that whatever happens at the end of the countdown will span the four directions. This could also be a reference to the 4 Horsemen of the Apocalypse. Furthermore, Archangel Michael will “slay the beast”, who is depicted on the back of the bill. (Sidenote: from my research, I believe Michael is the warrior side of Jesus Christ so it also refers to the 2nd coming). The female corpse in the crack can mean 2 things: 1) the whore of Babylon which may reference Hillary Clinton (which I think is a bit extreme personally. Obama was the anti-Christ last political season). Or it could reference Mary Magdalene and the Holy Grail — something ground breaking and revolutionary will be revealed. The Grail was thought to be under Solomon’s temple and the government building is implied it is Solomon’s temple. It is thought Mary Magdelene is the key to the destruction of the church if her role is revealed, which I personally believe to be the role of the female Messiah. That gets into a bunch of Masonic stuff and if I went there, I’d talk for hours. The Chinese character I think means “taste”. Obviously, it’s a reference to how the beast has come to “devour” everyone. Or we’ll get a “taste” of what is about to come. (Note: it actually means peace. The Anti-Christ is supposed to usher in 3 years of pease during his reign). The UN’s symbol is on there because as I’ve said before, I feel the creator is an anarchist. I have no proof of this next point but my sense is that the letter pairings are references to demon names. (I actually think they’re company names now. Same difference though). Obviously, baphomet is depicted as “lord” and the driver of this whole ordeal. That’s all I could pinpoint without having an actual copy in front of me. So it looks like the three Pillars are indeed a Masonic reference. The figure falling may or may not be a reference to Quilpoth, the inverted Tree of Life, which some people say is hooey and others say it’s demon worshipped. I’ve flipped the Tree of Life upside down and contemplated it to get a feel for Quilpoth. 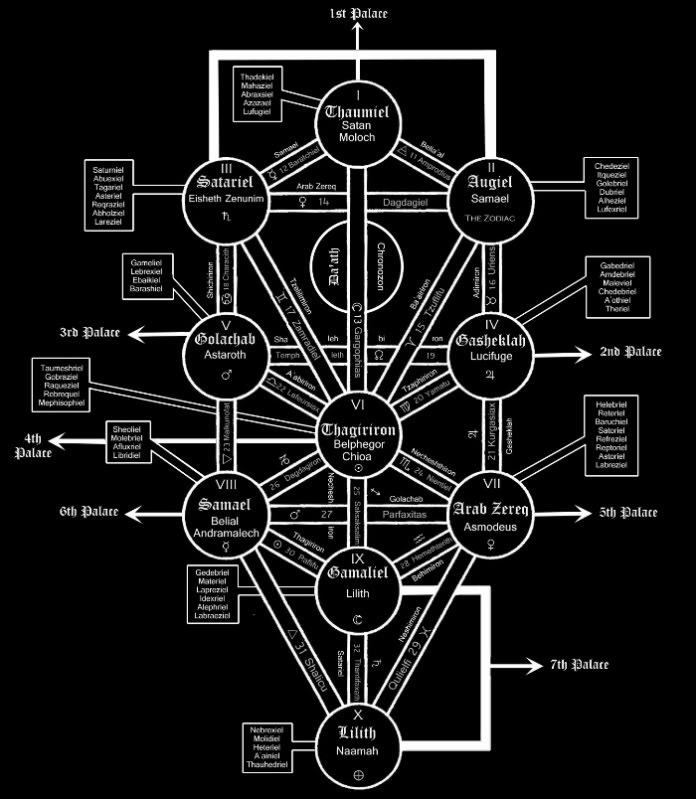 In my opinion, it’s the map of descending rather than ascending with earth being the highest level. Quilpoth makes me uncomfortable so I don’t know much more about it than that. Honestly, I doubt this group even knows what that is but it’s interesting when disceting symbolism. If it did refer to Quilpoth, I would guess we are about to be “plunged into hell”. The other Masonic symbol is the Orobus in what appears to be the gateway of Solomon’s temple. It is said in Apocalyptic texts that when Solomon’s temple is rebuilt, judgement day will be near. The books the dragon is sitting on are references to financial things and there’s also the Masonic square. So something will be built from something crumbling perhaps? Word on the street is that an economic crisis will happen at 4:00 today but I think this is just a brilliant marketing scheme. Most likely, they’ll just update the site again. I was curious why the creator didn’t reference the 7 seals, trumpets or bowls. That would have been interesting. Then I did notice the bowl the dragon was curled up around. First the 7 Seals break, then the Angels blow the 7 trumpets and the final wave of catastrophes is brought on by the 7 bowls being poured out. 777. We all know that number. The number of divine mystery and initiation. Interesting to see that included. Although the occult symbolism was well done, I think this extremist propaganda by an extremist, anti-government group or art movement that thrives on conspiracy theories. But it does pull you in. I have a feeling this person or group definitely believes all of this but if they can actually “make” something happen is TBD. It may be some kind of movement but it’s aim isn’t clear except “overthrow the NWO” because they’re the “illuminati” (that’s a whole other world of symbolism digging). So that’s my fun little analysis of the symbolism around some of the artwork put out by badselfeater.com I probably didn’t catch everything and who knows if I’m “right” or “wrong”. The fun thing about symbolism is that you can spin it however you want. So Remember kids, be logical and always read between the lines. And just say “no” to fear mongering. Afterthoughts: Well, the whole thing turned out to be a way to get people to watch bootleg anti-abortion video. So I was pretty much on the money with the Christian themes pointing to extremist motives. What a waste of brilliant marketing. ::smh:: I learned anything, it’s how to run a killer marketing campaign. This entry was posted in art, mysticism, mythology, occult, Qabalah, Uncategorized, Writing and tagged bad self eater, badselfeater.com, hoax, Masonic, mythology, qabalah, Revelations, symbolism. Bookmark the permalink. A is a deep symbol of its own. I also saw that it could mean “atom bomb”. I think it could mean a lot of things really.